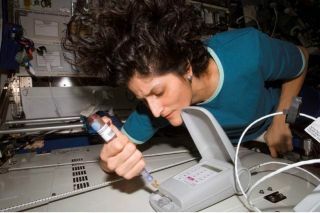 Astronaut Suni Williams, Expedition 14/15 flight engineer, works with the Lab-on-a-Chip Application Development-Portable Test System (LOCAD-PTS). Williams is placing the sample mixed with water from the swabbing unit into the LOCAD-PTS cartridge. LOCAD-PTS (Lab-On-a-ChipApplication Development?Portable Test System) is a hand-held device that candetect the presence of bacteria or fungi in record time. The device has beentested aboard the InternationalSpace Station. Astronaut Sunita"Suni" Williams opened the instrument kit bag, assembled LOCAD-PTS,and then took six readings during her recent mission to the station. "The first two readings were controls to showthat the instrument was operating correctly," explains Jake Maule,LOCAD-PTS project scientist at the Carnegie Institution of Washington. "First she swabbed her palm, which she had first pressed to handrails andother often-handled surfaces that should have had lots of bacteria?and indeed,we got a strong positive reading." The standard method ofculturing suspect bacteria is far more time-consuming. Typically, the investigatormust press a square of solid gel growth medium to a surface for a few moments,put it back in its package, and then let the sample incubate for a few days. LOCAD-PTS, on the otherhand, takes only a few minutes. The investigator takes a sterile dry swab(similar to a Q-tip) and rubs it on the surface. Then, ultra-clean water isflushed through the swab; a few drops of the liquid is dispensed into theinstrument (see LOCAD-PTSphoto). "Theability to monitor microorganisms would be especially important on long spacevoyages, not only to check the health of astronauts but also to monitorelectronics and structural materials, which can be corroded or otherwisedamaged by certain fungi and bacteria," says Wainwright. LOCAD-PTS isdesigned so that "astronauts can do the analysis onboard with no need to returnsamples to laboratories on Earth." Read moreat Science@NASA; also, Greg Bear wrote an interesting piece onbacteria in space - see Biospace21.